Many people wrote to extend condolences when ALS finally claimed Jamie’s life, and some shared insights about his positive spirit even before then. A few special comments are included here. In response to this ice bucket challenge, I actually visited a very dear friend of mine yesterday who is unfortunately dealing with the later stages of ALS. For a year, I spent a few hours each week helping with his mobility as we swapped stories of whitewater and rock climbing adventures, travels, relationships, and life. To see such an active, brilliant, inspiring soul essentially become limited within a body that now can barely provide him with the energy for a slow whisper is heavy on the heart... but at the same time still very inspiring, as our conversation drifted positively toward open reflections on life, love, self-expression, and worthwhile experiences. I have been able to use my experience with Jamie to help another in his beginning stages of ALS as he learns to cope with losing his ability to drive and walk, among other things we tend to take for granted. There's nothing a bucket of ice can help me prove (I've swam in Crater Lake and the North Sea which I can guarantee are colder!). But to keep the awareness spreading, my challenge to all is to keep kindness as your main priority... open a door, lend an ear, or just smile to those around you... and remember not to take the small things (like the ability to lift a bucket or speak in front of the camera) for granted. Even if you don't have money to donate, a little empathy toward others goes a long way, no matter what card someone is handed in life. One of the luckiest things ever to happen to me was meeting Jamie shortly after moving to West Virginia in 1985. Over the next decade, he guided me on a journey into a realm of beauty and danger. In the process, he gave me the greatest gift—a better understanding of myself. Morgantown at the time had a lot to recommend it, but high on the list was its proximity to world-class whitewater rivers. To enjoy this world, you needed skill, enthusiasm, and confidence in yourself and trust in others. It is not false modesty to say that I lacked in all these categories. Then I met Jamie. He was so enthusiastic about running rivers with groups of people—that community of "river rats" he so proudly counted himself among. But it was his generosity that set Jamie apart. Sure, he was proud that he and Betsy had canoed down the Colorado through the Grand Canyon. But he took even more satisfaction in helping others reach whatever potential they had inside themselves. Over many cold winter nights, Jamie patiently taught me how to roll my kayak in the WVU pool. It's a difficult and counter-intuitive technique, he would say, but it will enable you to go places on the river you wouldn't be able to otherwise. Someday, it might even save your life. Let's try that again. We became friends. But there was always a mentor-student nature to our relationship. I looked up to Jamie, and wanted to have the affability and optimism that seemed to come so naturally to him. He was so graceful with a paddle, so graceful with people. One night, a group of us were stranded overnight on one of the forks of Cheat River in early spring. As darkness fell, the temperature plunged well below freezing. We had no food or water, no way to make a fire, and everyone was soaked to the bone. As people began shivering, morale plummeted. Jamie kicked himself for not preparing better for such a situation. But he quickly stepped into his natural leadership role. He assured everyone that if we huddled together and shared our body heat, we could keep hypothermia at bay. He reminded us of that periodically through the long night. The next day we made our way down the river and out of harm's way. That was more than twenty-five years ago, but I can still hear Jamie's reassuring voice. His calm, reassuring voice, often accompanied by a warm, wide smile. Yes, he would say, it seems difficult right now, but you will get through it. You can make it. Let's try that again. ​I first met Jamie on a Sierra Club outing – a paddle trip on the upstream section of New River in West Virginia, if I remember correctly. I believe that our group consisted of Jamie, his wife Betsy, and fellow Sierra Club members Paul Turner and Mary Wimmer. For me, it was great to make new friends who liked to spend time on rivers. I was working as the resource manager at New River Gorge National River and longed to meet people who were interested in paddling and had weekends off. I believe that everyone stayed at my house near Oak Hill before and after our river trip. I was especially impressed by Jamie’s knowledge of river running, his willingness to share his knowledge, and his friendliness. At the time, I was trying to improve my river running skills and he would prove to be helpful for that. Jamie introduced me to the Three Rivers Paddling Club, based in Pittsburgh, PA. They ran river trips and also held clinics to work on paddling skills. It wasn’t too long before Jamie, Betsy and I were enrolled in a clinic on Slippery Rock Creek – I was in a more basic class than they were. I got to practice entering eddies and peeling out. I had a western style roll that I’d learned in Idaho, but I tried to learn a typical eastern style C to C roll on the other side. After a clinic or two, Jamie suggested and organized a number of trips – the Middle Yough in Ohiopyle State Park, the Lower Yough, portions of the Cheat River. Slowly but surely, I learned to paddle, and eventually I did the New River Gorge and the lower section of the Gauley River. Cherry Creek, Casselman River, and a section of the Tygart River were other favorites. 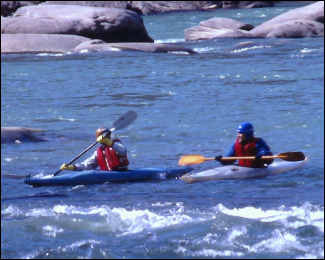 Jamie and Betsy were frequent companions on these river trips – paddling a tandem canoe outfitted for whitewater. Jamie always provided suggestions and advice on equipment and paddling techniques. He and Betsy practiced “no-fault” paddling – a successful strategy for tandem boaters. It was during my first full year of paddling that Jamie suggested we run the Grand Canyon. He and Betsy knew folks in Tennessee who were organizing a trip for paddlers who would run the big river on a commercial permit. I signed up, with the knowledge that if things got too difficult, I could put my boat on the large raft through the more difficult stretches. As it turned out, I paddled the whole thing with just a couple of portages, alongside Jamie and Betsy in a tandem canoe and others in solo canoes and kayaks. This adventure on the Grand Canyon was one of my most memorable experiences with Jamie and Betsy. Our boats and gear were being transported by others on this 17-paddler trip. Jamie, Betsy and I were flying; but we almost missed our connection in Phoenix! As we were running from one terminal to another, we decided that Jamie could run the fastest. We told him that we would carry his bags while he ran ahead and told them to hold the plane. We just barely made it; they closed the door right behind us. We had one extra day before our trip started and we wanted to hike into the canyon. We chose the 12-mile round trip to Plateau Point, which overlooks the Inner Gorge just below Indian Gardens and the South Rim. The rapids that we saw from that view point were intimidating – we were going to paddle this! It was early September – hot weather. We decided that we would each drink one liter of water between each of the water stations located at 1 ½ mile intervals on the Bright Angel Trail. It was a long climb, but drinking that measured amount of water made us all feel better as we topped out at the rim. We met the rest of our group and spent the night at Marble Canyon Lodge. None of us slept. All through the night, I heard one person after another rolling over, getting up, trying to fall asleep. Nerves, anticipation, fear about what we were undertaking – all those emotions were there as we anticipated the next day’s launch for a 13-day paddle. Jamie was a leader of the group. He and Betsy evaluated the tough rapids; some they ran, some they portaged. In a tandem canoe, their ability to maneuver was sometimes different than for folks in other watercraft. But all the decisions were good ones, and we all arrived safely at the Diamond Creek takeout 13 days later. We turned our images of this trip in to a slide show that we presented at the National Paddling Film Festival in Lexington, Kentucky. This required collaboration among the four of us in our paddling team. I learned the road between my house in Oak Hill and theirs in Morgantown very well. We selected music and chose from hundreds of slides (remember those days of using film?) to produce a 20-minute show that illustrated our exciting trip. In February, we presented our program. If I remember correctly, there were some technical problems and we didn’t win our category, but we had a great time watching other slide shows and videos and presenting our own. I continued to attend the film festival in later years. One year, Jamie and Betsy were interested in going but wouldn’t commit, which seemed quite uncharacteristic for them. Turned out they adopted Wesley just before the festival; I knew there must have been a good reason for their indecision. I moved to Arizona in 1991, which ended my regular paddling lifestyle. But the memories of great times on rivers remain. Jamie was a great outdoorsman and adventurer- he skied and rock climbed in addition to running rivers. He was a patient instructor, an enthusiastic supporter, and a builder of confidence. He turned his outdoor adventures in to significant support for conservation, particularly with the West Virginia Rivers Coalition, of which Jamie was a founder. Though I moved far away, I never felt far away from Morgantown, where I knew Jamie, Betsy, and Wesley were pursuing family interests, environmental causes, and professional successes. We wrote, called, and occasionally visited each other. And when I last saw Jamie, early in 2014, he greeted me with a great big smile. I miss you, Jamie. See you in the next eddy.